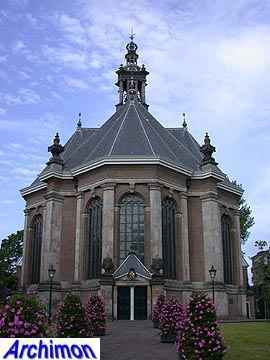 A peculiar example of early protestant church architecture from the 17th century; whereas for other churches often a circular or octagonal ground-plan was chosen, architect Pieter Noorwits for this church opted for two octagonal spaces connected by a slightly narrower rectangular space where the pulpit was positioned, thus still complying to the protestant ideal of a centralized church. Inside there are no pillars that could possibly block the view. The ground-plan necessitated the complex roof construction. 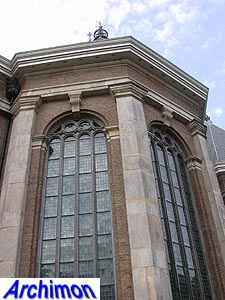 Before this church was built the protestants had already confiscated two catholic churches, the Grote Kerk and the Kloosterkerk. 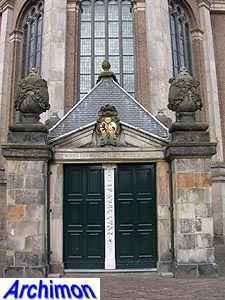 Apparently these were not enough, even though only protestants were allowed to use them, and a third church was planned already in 1639. It took 10 years before work started. 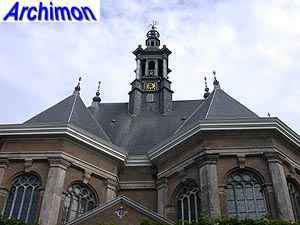 Both Bartholomeus van Bassen and Pieter Noorwits made a design. 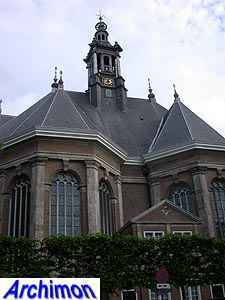 Noorwits' design was chosen, and the church is the only design by this carpenter that was ever actually built. 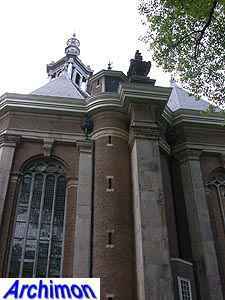 Van Bassen was involved with the construction until he died in 1652. 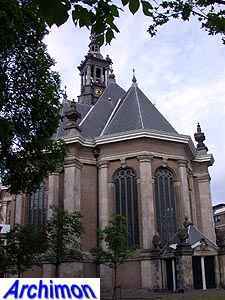 The church was completed in 1656. 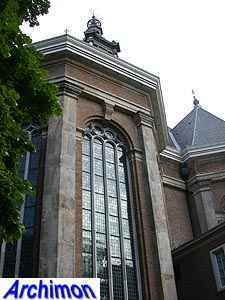 Many aspects of the church are typical for Dutch late-Renaissance and Classical architecture; the large rounded windows, the tympanums at the entrance and the belltower, the decorative vases that mark the outer corners of the church, not to forget the belltower itself that is very similar to those on many other protestant churches of that period and later; it is clear for all to see that this is not a catholic church. A bit of a shame is the presence of two extensions to both sides of the middle part of the church that appear to be of a much more recent date and look a bit out of place. But then, so do many buildings surrounding this church. It's hard to believe that the church once stood close to one of the city's harbours. It must have been a very picturesque place back then, but the harbour has been filled-in long since, and most of the old buildings in the neighbourhood have been demolished and replaced by modern buildings without even the slightest architectural value. 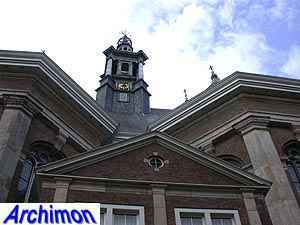 The church itself was closed in 1967. After a restoration the building opened its doors again, now as a concert hall.